This book of letters reveals an intimate and unique relationship between a teacher and pupil on the Sufi path. A contemporary western mystic, Shamcher Beorse had been a pupil of the great Sufi, Pir-o-Murshid Inayat Khan in the 1920’s. Carol Sill was a young beginner on the spiritual path, grieving the sudden death of her only son. Fly along as Shamcher intuitively guides her through the winding routes of Love’s progress, growth and development. With Shamcher by her side she opened to a world that had been previously closed to her. Share her discoveries as a dazzled and astonished neophyte, learning how to live without her body, and to proceed beyond eyes, ears and even beyond mind. 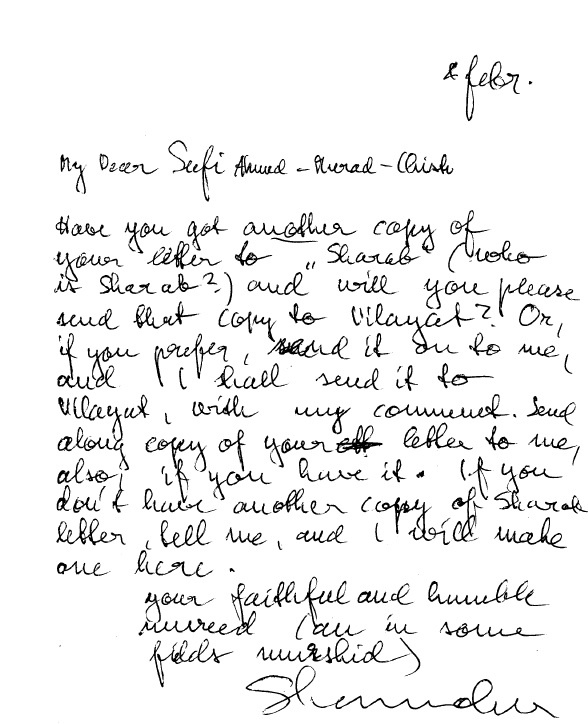 This process of inner development is all documented here – in real time, through the original correspondence, for Shamcher mailed all Carol’s letters back to her, with copies of his own, asking her to publish them. Read this book as it was written: as an unfolding correspondence of the soul. Find out more at the website for the book, or see it on Amazon. Also available on Kindle. This just to thank you so much for sending me Sangithas and other documents. 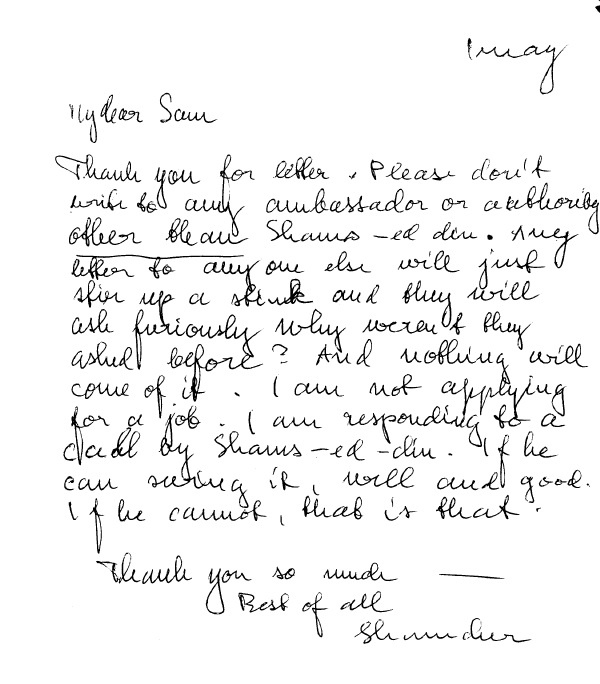 Some of the Sangithas confirmed what I already wrote to Headquarters after Musharaff Khan’s passing, which opens up new vistas for either good or worse Haag administration and liaison with sufis (Inayat’s disciples). You are so absolutely right in pointing to God, Allah, Brahm, Ishwara, Dieu, Gott — rather than persons. Of course, not all are yet at that stage, but even so, it should be kept in mind, and heart, even at the initial stages and besides, all are really on all stages all the time though with a different emphasis. It is also quite true that “families” are unfortunately made to intrude between God and man but some, within these families show so much promise that you hide their faults even to your own sight because you see their great potentialities, and you foster them by stressing them instead of the temporary faults. Others, within same families, are so far astray that you don’t care to foster anything, you rather try to keep them off your mind. Rumi, that great poet and mystic, quite often fell to unnecessary criticism and wailing over the state of the world and most prophets did. We, at this unique age, could rise above that and thus come even closer to GOD and Allah and dance around in this splendid atmosphere until we, also, become outlived as useful and give room for others. the young, as you say, which of course does not mean young in earthly years but in spirit, outlook. I am the youngest, almost too young. You come next. What you say about Idries Shah is interesting and true. I am greatly freshened by his keen outlook. He borders on the mystic but still has enough fire of the mind to be most interesting and slightly less mystical. Like all men he is true and a bit false, great and a bit small. Even most sufis are, except perhaps El Ghazali and, to some extent, Inayat Khan. They seem close to perfection. But even in the Sangithas traces of imperfection sneak in.